The founder of Poundworld has said that the discount retailer's administrator is putting a rescue plan at risk by dragging its feet over striking a deal. 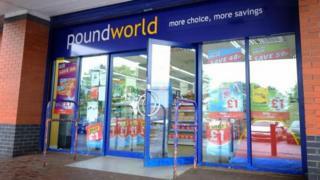 Deloitte was appointed as the administrator of Poundworld in June after talks with a buyer failed. Chris Edwards says he made an offer four weeks ago, but has only just got access to Poundworld's headquarters. Deloitte said: "No party has presented a credible and acceptable bid with accompanying confirmation of funding." Mr Edwards, who started Poundworld from a market stall in Wakefield in 1974, has made an offer for 186 stores which he says would save around 3,000 jobs. The retailer has 355 stores and employs 5,100 people. A spokesman for Mr Edwards says that he is financing the majority of the offer himself using his own wealth, with the additional backing of "an anonymous party". Mr Edwards says that despite contacting Deloitte four weeks ago, his team has only just been given access to Poundworld's head office in Normanton to check stock levels. He also says the team has just been granted permission to start talking with Poundworld's bankers at Santander. "The process has taken so long that the shops are now holding closing down sales and selling stock that isn't being replenished, so with every day that passes, the task of saving the business becomes more difficult and puts another nail in the coffin," he said. In a statement, Deloitte said: "The administrators continue to seek a buyer of all or parts of the business. "We have provided guidance to indicate how a successful bid might be structured and have provided detailed information to assist bidders in an effort to help them wherever possible. In the interim, as one would expect in these circumstances, we are preparing for all eventualities as this process continues." Last month, Poundworld's private equity owner, TPG, put the business into administration after attempts to sell the chain to investment firm R Capital collapsed. At the time, Deloitte said: "Like many High Street retailers, Poundworld has suffered from high product cost inflation, decreasing footfall, weaker consumer confidence and an increasingly competitive discount retail market."